You’d be surprised at how easy it is to turn Shopify social and reap the rewards from customers being able to easily share your products, make recommendations to their networks, and provide useful feedback about how they use and interact with your products. There are a couple steps you can take to improve social sharing in your store: add sharing buttons to make it easy for customers to share you products, and make sure your site is formatted so that sharing looks great across all social networks. Social media can drive a lot of traffic to your store, so you should make sure it’s easy to share products and that social shares will look great across several platforms. One of the first and easiest things you can do to help your store’s social eCommerce is integrating share buttons on your store. You can enable these for a number of social media platforms that you want to target. Apps like Share Buttons & Social Media Apps by GetSocial allow you to integrate share buttons on different pages without the need to write any code. You can also use our Happy Ending app to integrate social buttons and feeds on your checkout’s ‘Thank You’ page. This allows customers who have just purchased your products to share their purchases on social platforms. Here is a screenshot of how you can include social sharing through the app. 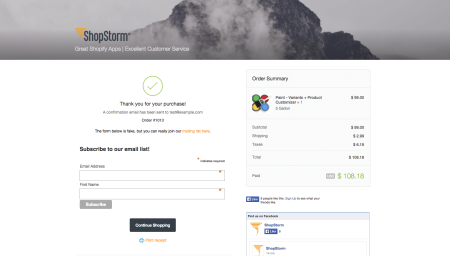 Making it easy to share your products with one click makes customers more likely to do so. You’ll also want to create rich formatting for your products optimized for specific social platforms so that shared content from your site always looks great. You can create Twitter cards or Rich Pins for Pinterest to control how your product images and short descriptions are displayed when your products are shared on these networks. Shopify has integrated both Twitter cards and Rich Pins for Pinterest right out of the box so that tweets and pins from your site always have rich formatting. Take a look at the below example by Shopify of what a Twitter card looks like where product information has been optimized. Enabling Twitter cards is usually done by your theme, but if not, you’ll need to do it manually (which does require you to work with some code). You can also use apps like Twitter Cards to enable these without writing or editing any code if your theme doesn’t include the markup for Twitter cards. 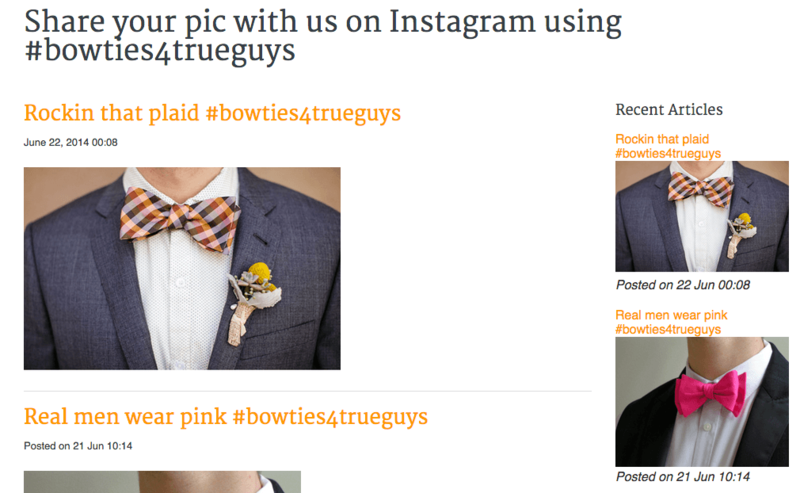 Another great way to optimize your store is by sharing user content and feeds. Our BlogFeeder app allows you to import feeds from various channels and social platforms including Facebook, Tumblr, and Instagram (tags and users). For Instagram, you can focus on specific keywords or hashtags that you promote for your products and import all photos that Instagram users have posted using those tags. 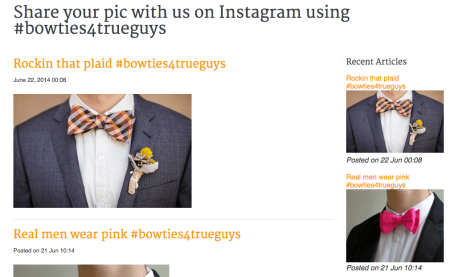 Displaying user photos builds your brand reputation as it is an endorsement by customers who have made the effort to share these. It also shows potential customers how others are using your product and can also be a great way for you get feedback. You can then delete or edit these as needed, as they’re each imported as a Shopify blog post. Other apps like Instagration allow you to approve Instagram images before they are posted on your store instead of moderating them after the fact. By optimizing your store for social sharing, you enable your customers to be your advocates and market your products to their networks. But, not all social platforms are created equal. That’s where Pinterest comes in. Of all the social media platforms out there, Shopify is best integrated with Pinterest. Pinterest is focused on sharing and bookmarking (or “pinning”) of visual cards. Shopify gives you two ways to integrate Pinterest with your store: by adding Rich Pins or by using Pinterest as a sales channel through Buyable Pins. Pinterest has introduced Buyable Pins that allow people to buy Shopify store products directly on Pinterest by clicking the ‘Buy it’ button. 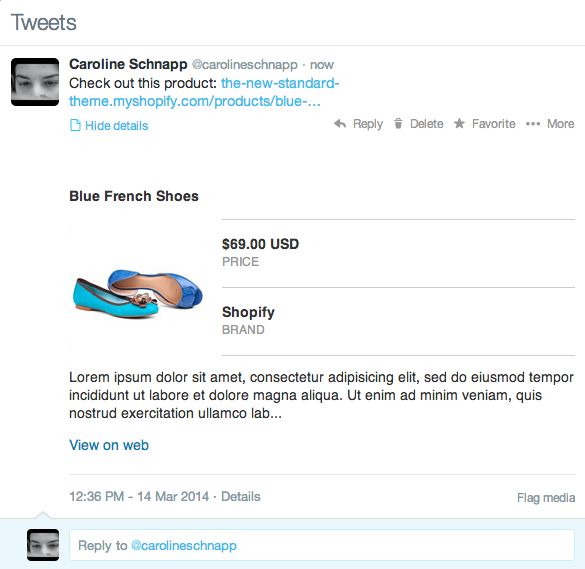 Rich Pins allow you to optimize the format of pins for your products (similar to Twitter cards). This helps you control the information displayed on pins for your products and creates a better user experience for Pinterest users interacting with those pins. The Pinterest sales channel for Shopify takes it a step further buy allowing people to directly purchase your store items on Pinterest. All purchases and customer information is seamlessly synced between your store and your Pinterest account. First things first. Make it easy for your store visitors to share your products on Pinterest by adding a share button for Pinterest. When you enable either Rich Pins or the Pinterest sales channel for your store, any existing pins for your products are automatically converted up, along with any new pins created for your products. In addition, any price or product detail changes are automatically synced from your Shopify store with Pinterest pins of your products. NOTE: Keep in mind that your store has to be eligible before you can enable the Pinterest sales channel. In a previous post, we discussed why referral programs work and how to start a referral rewarding program for your Shopify store. Rewarding customers can encourage them to make repeat purchases, share your store with friends, or other behavior you want, by giving them an incentive. Even though you give them a discount, the extra revenue from referrals may be able to offset the lower profit from discounts. There are a number of apps like ReferralCandy and LoyaltyLion – Loyalty Program you can use to start a rewards program on your store. These apps automatically track and manage the rewards and traffic generated by customers’ referrals. In addition, customers have to sign up on your store in order to start getting rewards. This builds a stronger connection that an existing customer has with your brand. Most major referral programs make it really easy to share their product and a unique discount code on social media (think Uber, Dropbox, etc.). Referral apps on Shopify help you do the same for your store. Shopify allows you a lot of flexibility to implement your social media strategy. Your social media strategy can focus on a number of things like growing your brand awareness, profiling customer interaction and usage of your products, increasing sales by selling directly on a platform, or growing your referral network to funnel customers. Pinterest remains the most integrated social platform on Shopify and can be a great avenue for your social sales. You can also optimize your store and products for other social platforms, for example, by creating Twitter cards. In addition, putting share buttons on your products or during checkout helps your store visitors and customers easily tell others about your products. Remember, your social strategy should focus on as much interaction as possible, and shouldn’t just be an information dump. Social, by definition, is a two-way channel that let’s you inform your customers or potential customers about your products, listen to feedback from your users, and enable customers to easily share your store with others. This builds your brand awareness and reputation. What is the focus of your social media strategy? Tell us in the comments below.